MEMPHIS, TN — Going to jail is not at all pomp and circumstance. But for a family of courageous sisters, it was a “badge of honor” to be carted off to jail 17 times during the turbulent civil rights movement. On March 25, more than 50 years later, a historical marker was unveiled honoring Ernestine Lee Henning, Sandra Faye Lee Swift, Brenda Lee Turner, Elaine Lee Turner, the late Joan Lee Nelson, Peggy Jayne Lee and Susan Carlotta Lee. “This is living history,” said Jimmy Ogle, county historian for the Shelby County Historical Commission, which preserves, educates and approves requests for historical markers. The marker was unveiled in front of Royal Furniture at the corner of South Main and Gayoso, site of the former Black and White Store before it was renamed Shainberg’s, where Ernestine and Elaine were arrested. It was Gray and Markhum “Mark” L. Stansbury Sr., a WDIA luminary and fellow Commission member that set in motion the process to preserve the legacy of the Lee sisters after the death of Joan Lee Nelson last year in September. 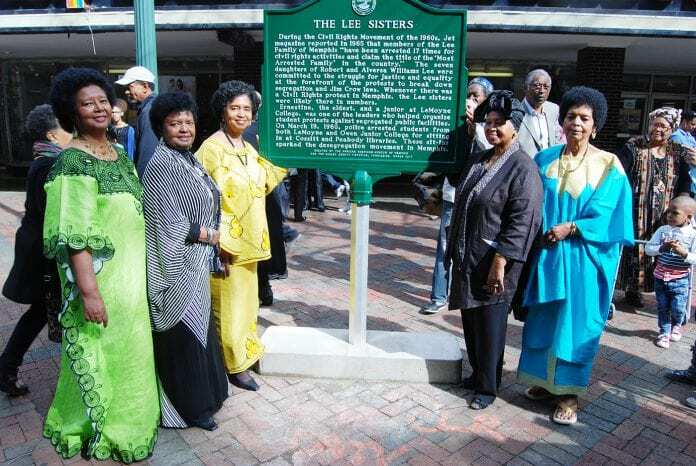 “Tell the Lord thank you for the Lee sisters,” Stansbury told the intimate group of family and supporters that gathered around the marker to witness living history and the story of the sisters’ gallantry. Vasco “Smitty” Smith III, son of the late civil rights activists Vasco and Maxine Smith, referenced the Lee sisters’ tenacity to stay the course despite the fact that some activists were injured or killed in their pursuit of justice and equality. “This is one strong, brave group of women,” Smith said. Grace Meacham, a retired schoolteacher who attended the former LeMoyne College with Ernestine and likewise sat in with her at libraries and lunch counters, said the Lee sisters deserve recognition for their contribution to civil rights. “It has taken 57 years for the sit-in movement to be recognized,” said Meacham. There were accolades aplenty during the unveiling ceremony, including a reference to a 1965 Jet magazine article hailing the Lee sisters, and brothers, as the most arrested civil rights family in the United States. “I was in high school at the time,” said Brenda Lee Turner, reflecting on her arrest record with three of her sisters at Peggy Jayne Lee’s law office a couple of days before the marker unveiling. Peggy was around 12 years old when her older sisters were getting arrested for sitting in at department stores along Main Street. She couldn’t wait to follow their lead. Neither could Susan, the youngest sister. Ernestine, the oldest sister, was compelled to fight for justice, determined to end discrimination, and hell-bent on dismantling Jim Crow laws. She led the charge to desegregate lunch counters, libraries, stores and other facilities. “It just wasn’t right,” said Ernestine, who lives in Los Angeles. Getting up every day to picket, march or sit in was a “daily duty” the sisters took pride in. Elaine said their parents, the late Robert and Alversa Lee, encouraged their 14 children to stand up for justice. They stood up and sat in, too, to call attention to the city’s unfair treatment of African Americans and the upheaval that had spread throughout the South across political and social spectrums. More than a decade after the civil rights movement, Elaine and Joan would continue to fight and educate people eager to learn about local African-American history. In 1983, they founded Heritage Tours. And they will come to learn about the Lee sisters too.